FrePPLe allows users to easily create alternative plans. A scenario is complete sandbox copy of all data, such that any modification done in it doesn’t impact the production plan. 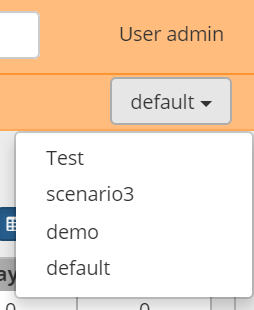 When scenarios are in use, a drop down list appears in the upper right corner. It allows you to select the scenario to work in. Only scenarios to which you have access rights will be shown in the list. During the installation a number of what-if slots (3 by default) are configured by the administrator. See this page for the details. Free: The slot is currently unallocated and available for use. In Use: Data has been copied into the scenario slot. Users can freely work independently in the scenario, without affecting the main model. Copy is used to duplicate an existing schema into a free slot. After copying the scenario slot moves from free to in use. Release is used to flag that work on the what-if scenario slot has finished. After releasing the scenario slot moves from in use to free again. The label shown in the scenario selection dropdown can also be updated in this screen. Access rights and permissions can be managed for each scenario individually. 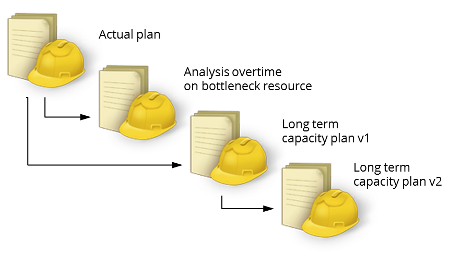 When copying of a new scenario, it will initially be accessible by 1) the user creating the copy and 2) all superusers in the source scenario. A user must be marked active in a scenario before it will appear in the list of available scenarios. The superuser status of a user can be different in each scenario. Users can have completely different role and permissions in each scenario. The list of users and their passwords is always identical in all scenarios. See User permissions and roles for more details on the configuration of access rights.